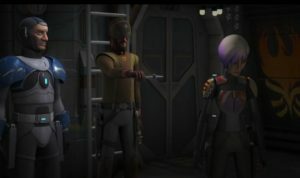 While holding out the darksaber for Sabine to take, Kanan then cautions her, “Listen: once people know you have it, you will be challenged and you need to be able to defend yourself.” While Sabine says, “Okay, I’ll try my best”, Kanan then maintains control of the darksaber. 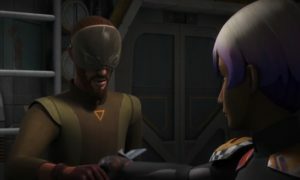 After some further back-and-forth, with Kanan maintaining control of the darksaber and Sabine continuing trying to take it, almost simply to get out of the conversation (including her saying, “Give me the sword”), Sabine realizes that she needs to take this seriously. 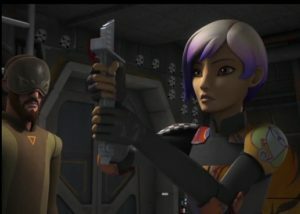 Throughout the set-up to this episode, the initial dialogue between Fenn Rau and Kanan about the darksaber, as well as the following discussion between Sabine Wren and the rest of the Ghost crew, they believe that she has the potential to not only wield the powerful darksaber as a weapon, but also to wield it as a symbol of power amongst her people and to become a leader. 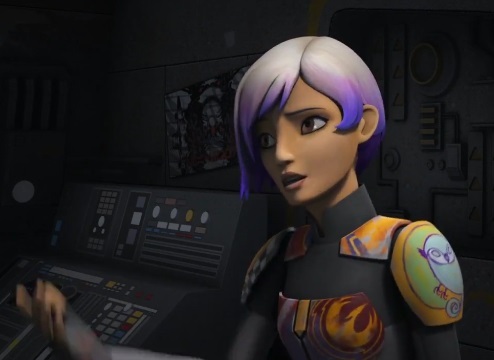 She, at this point, has a strong amount of skepticism about her relationship with her people and becoming a leader amongst them.